Even though Hernán Cortés himself visited La Paz in 1535, the La Paz area was doomed as a settlement through much of Mexico's colonial period. Also visited by Captain Sebastian Vizcaino in 1596 who named the city La Paz (peace), a semi-permanent settlement that was established by Jesuit missionaries in 1720 became Mexico's first real attempt to settle the area. This lasted only 30 years as indian revolts, disease and Baja's harsh setting led to abandonment. A permanent settlement wasn't established again until 1811, and in 1829 La Paz become Baja California's capital when Loreto was leveled by a hurricane. In September, 1846, the Mexican-American War came to La Paz. U.S. Commander Samuel F. Dupont seized the city and signed a promise of neutrality with Colonel Francisco Palacios Miranda, then governor of Baja California. Citizens of La Paz would be involved in both peaceful negotiations and insurrections against the Americans for the next 2 years. A strong pearling industry kept La Paz going until the 1930's when the oyster beds were destroyed by disease. 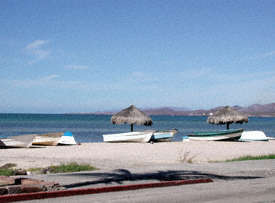 La Paz languished until the trans-peninsula highway was completed in 1973, and La Paz became capital of the newly formed state of Baja California Sur in 1974.